Start your vacation in Bavaria’s capital, Munich, and visit the charming town of Oberammergau and the fairytale castle of Neuschwanstein. Board your river cruise vessel in Passau and sail down the Danube, stopping to visit magnificent Melk Abbey or Schallaburg Castle, and the small town of Dürnstein in the Wachau Valley. 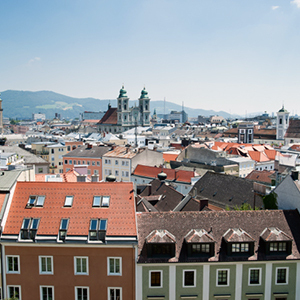 End your cruise in Austria’s capital Vienna, with guided sightseeing and plenty of time to explore this “City of Music” on your own. Welcome to Munich! The rest of the day is free to start exploring. Munich, capital of Bavaria, offers a small-town feel with its pedestrian- and bike-friendly atmosphere. With its historical museums, splendid English Garden, traditional cafés, and delightful shops, Munich has plenty to see and do. A LOCAL GUIDE will show you the highlights of this fascinating city, including Nymphenburg Palace, summer residence of the Bavarian monarchs; MARIENPLATZ with its Old and New Town Halls; and the gothic Frauenkirche, a prominent landmark for Munich. Then, enjoy time on your own in this vibrant city. Watch the famous Glockenspiel, recreating a royal wedding from the 16th century; enjoy the pedestrian zone; linger at an outdoor café; or visit St. Peter’s, the oldest church in town. Why not visit the Viktualienmarkt with its Maypole that carries figurines featuring the arts and crafts of this region? This large market is popular for fresh produce, meats, cheeses, spices, baked goods, flowers, and more. Or, maybe relax alongside the locals at one of the Biergarten or breweries to sample Bavarian beer specialties. This morning, a full-day outing takes you into the garden-like landscapes of the Bavarian Alps and for a visit to King Ludwig’s fairytale NEUSCHWANSTEIN CASTLE, situated high above the village of Hohenschwangau. Continue to Oberammergau, famous for its once-a-decade production of the Passion Play. Enjoy free time in this small town to stroll along the streets and admire the typical Bavarian houses, many beautifully painted with scenes from fairytales. Enjoy a free morning in Munich, then, in the afternoon, drive to Passau, ideally located at the confluence of the Rivers Inn, Ilz, and Danube. Alternatively, you might like to join a full-day optional excursion to Salzburg, which will end in Passau with embarkation on your ship. Meet your crew at a welcome reception this evening. A day of charming towns and magical scenery awaits you today! In Melk, you may choose between a GUIDED VISIT of the magnificent 11th-century BENEDICTINE ABBEY, one of Europe’s largest monasteries, or renaissance SCHALLABURG CASTLE. Melk’s abbey towers over the town and its church houses stunning frescoed ceilings and an ornate library with a large collection of medieval manuscripts. Schallaburg Castle was built as a defensive stronghold 900 years ago, but was later redesigned as a magnificent princely home. Next, head into the heart of the Wachau wine region to Dürnstein known for its magnificent baroque Stiftskirche with its blue façade, – and join a Certified Local Guide for a guided walk. Attend an informative tasting & presentation on Wachau Valley wines. Hotel located in city center near Stachus Square and pedestrian area – Traditional exterior with contemporary room design. Art of Beer: a real tribute to Bavarian beer We’ll take you on a journey deep into the heart of Bavaria. Only 56 miles (90km) from Munich lies the world’s largest hop growing region. Visit one of the most unusual breweries of Bavaria, the Kuchlbauer Brewery, where beer and art fuse into a unique experience. The landmark of Kuchlbauers World of Beer is an architectural project of the world famous artist Friedensreich Hundertwasser. Pleasant round forms, dancing windows, wavy floors and natural lines, onion domes and plants – these are the elements Hundertwasser portrays representing his love for humane structures in harmony with nature. The Kuchlbauer Tower is a one of a kind building: the inside as well as its outside structure is homage to Bavarian beer and its breweries. Continue the tour visiting the Hop Museum, where you will learn everything about hops, from botanical aspects to brewing, from hop growing to hop trading, from past till present. After you learn in an entertaining way some interesting facts about the art of brewing good beer and hear a lot about beer which is probably news to you, you will spend time tasting these highest-quality beers. A truly unique Bavarian experience. Dachau Concentration Camp Of the many picturesque towns and villages that lie on the outskirts of Munich, one of the prettiest is the old medieval town of Dachau. Today, just outside the town center, a major international Memorial Site stands on the grounds of the former concentration camp, an enduring testimony to the evil that was born among the rustic charm. KZ Dachau was the “Academy of Terror”, the first Nazi concentration camp, role-model and training ground for the vast order of brutality that spread over half of Europe in the wake of the armies of the Third Reich, and which ultimately culminated in one of history’s greatest crimes: the Final Solution. Today’s Memorial Site combines the historical authenticity of the original environment and its many surviving buildings with the function of a modern exhibition center. It is a place of memory, of pilgrimage and of education. The guided visit can be challenging but also a deeply moving and memorable experience.